The approach to the front of the home is architecturally beautiful with pillars and widows walks. The client also installed a koi pond and waterfall, creating a fabulous point of interest. For interior designers Marilyn H. Rose and Stacey P. Walker, of Marilyn H. Rose Interiors, the opportunity to collaborate and design a home reflective of the luxury and beauty of the Hamptons, was one of their most rewarding to date. The project began 16 years ago, when Marilyn H. Rose Interiors was contacted by clients who wanted to enlist the designers’ help in creating their dream home in the Hamptons. Fortunately, the house was still under construction when the design process began, which allowed for architectural changes to be made at that time. This light and cheerful kitchen was where the design process began. The cabinets are a soft glazed cream color, with dark green marble on the counters. The design process began in the heart of the home, the kitchen; the central location for entertaining. It was important to create a space where the client’s family could gather together and create memories for years to come. To achieve the light and cheerful kitchen they desired, Marilyn and Stacey opted for soft-glazed cream cabinetry, contrasted with dark green serpentine stone countertops in Vermont Verde marble. Incorporating fun and function into their design, the lighting fixture selected, one of the kitchen’s main focal points, doubles as a pot rack displaying the client’s gorgeous collection of copper cookware. Bright and cheery, the dining room has a very inviting feeling for a lovely family dinner and highlights a beautiful fireplace. The dining room was designed to maintain the bright and cheery personality of kitchen. At its entrance, built-in cabinets were installed to create additional storage space for the client’s dinnerware and a beautiful fireplace was designed to serve as the room’s focal point. The simplicity of the drapery was created to complement the tones of the wallcovering and highlights the client’s beautifully landscaped view. This bright sunroom is the family’s go-to space for breakfast, lunch or just gathering. Sixteen years ago, an unusual addition to any residence was a home elevator. This caused a lot of interest in local newspapers and magazines, followed by many interviews. To complete this area, it was then faux finished by a local artist. For the clients, it was important for the beauty of the outside to be compatible with the inside. While nature’s inspiration can be seen throughout the home, it is most visible in the design of the sun room. To maximize the use of natural sunlight, the rooms’ windows were largely left untreated. Beautifully draped swags were designed to enhance the lower tier of windows, and were created using a floral fabric in hues of green and red. Florals were also incorporated into the fabric of the arm chairs, as well as used to accent and accessorize the room. The warm and inviting master bedroom is still au courant even though it was done 16 years ago. The homeowner still adores it and its design stands the test of time. The elegance and charm of floral patterns and prints were carried into the design of the client’s master bedroom and bath. Custom bed and window treatments, as well as wallcoverings, accent both rooms in a mix of soft greens and pinks. In the master bath, careful attention was paid to the moldings and millwork framing the bathroom and bathtub, and topiaries were used to incorporate the beauty of the outdoor gardens. A gilded mirror, crystal and silver candlesticks and topiaries adorn the fireplace mantle. 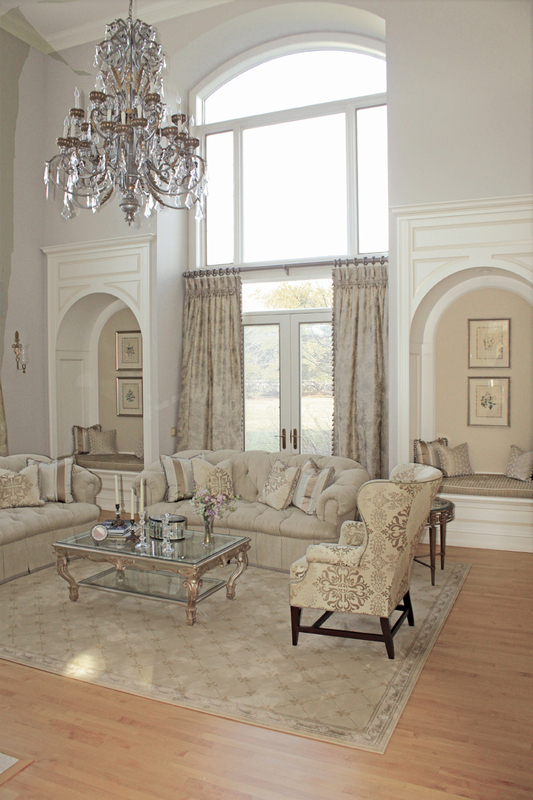 One of the final rooms to be designed was the home’s great room, a true collaboration between designer and client! The room’s color scheme was derived from the chair fabric – a pattern the client fell in love with. Pulling from the soft neutrals of the fabric, the walls were painted in a soft dove grey, and a light taupe was used to accent the built-in niches. The color palette extends into all of the upholstery and pillows, as well as the window treatments and area rug. Being sure not to take away from the tall windows, and the abundance of sunlight they bring, the window treatment consists solely of side panels, hanging from beautifully decorative rods and rings. In this room, it was all about small details, with big impact. The chandeliers were faux-finished and four separate paint colors were hand-selected to highlight and accent the intricate detailing of the fireplace. The mantel was accessorized by using a mix of silver and crystal candlesticks, as well as two topiaries. A gilded mirror sits above the mantel, reflecting the beautiful chandeliers, and light in the room. This little bar area was created from a small coat closet in the great room. Its location was convenient for entertaining guests. Serving as a wonderful place to entertain guests, a coat closet in the great room was converted into a bar area, complete with upper and lower cabinets for storage, and a countertop with a built-in sink. As the clients also have a large family with a lot of grandchildren to entertain, the home’s lower level was converted into a recreation room complete with a pool table, card table, movie theater and popcorn machine. Our client’s have a large family with grandchildren, so this lower level area was made into a recreation room. A great hangout on a rainy day! One of the greatest joys as a designer is creating a space for memories to be made. The design of this home perfectly represents the client’s elegance and charm and will remain as timeless as the moments shared here.